NASA has decided the final museum homes for its space shuttle fleet. 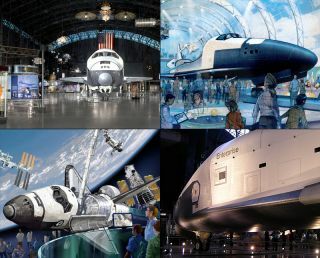 Shuttle Discovery will go to the National Air and Space Museum’s Steven F. Udvar-Hazy Center, Chantilly, Va. (upper left); the shuttle test orbiter Enterprise will go to the Intrepid Sea, Air & Space Museum, New York City (illustration at upper right); shuttle Atlantis will go to the Kennedy Space Center Visitor Complex, Florida (bottom left). The test orbiter Enterprise is shown at bottom right. NEW YORK – The crowd of schoolchildren, tourists and museum workers exploded in cheers yesterday when they learned New York will be the final home of NASA's prototype space shuttle, Enterprise. But not everyone is so happy. The critics are speaking out today (April 13) after NASA chief Charles Bolden unveiled the space museum destinations of Enterprise and the three working space shuttles in a long-awaited announcement following months of internal review. Enterprise, which was used in early glide tests but never made it to space, will be added to the Intrepid Sea, Air & Space Museum, which is housed in the World War II aircraft carrier USS Intrepid at Pier 86 on the west side of Manhattan. NASA's three working orbiters – Discovery, Atlantis and Endeavour – will be headed to, respectively, the Smithsonian's National Air & Space Museum in Washington, D.C., the Kennedy Space Center in Cape Canaveral, Fla., and the California Science Center in Los Angeles. Discovery will replace Enterprise on display at the Smithsonian. Disappointment at the announcement was especially keen around Houston's Johnson Space Center, which houses space shuttle mission control and where the astronaut corps lives and works. Sen. John Cornyn, R-Texas, said in a statement, "Houston has played a critical role throughout the life of the space shuttle, but it is clear political favors trumped common sense and fairness in the selection of the final locations for the orbiter fleet." "We were tremendously surprised," Intrepid museum president Susan Marenoff-Zausner told SPACE.com. "We're very, very excited to be awarded this." The Intrepid crowd didn't seem to mind the fact that Enterprise hasn't been to space. "There was no preference; we wanted an orbiter," Marenoff-Zausner said. "We just are so flattered that we are one of four venues out of these original 29 … and that NASA saw us as fit to be able to house one of these." The Intrepid museum offered free admission yesterday to any guest wearing space-themed clothing. One of the museum's visitors, 28-year-old New Yorker Mike Buzezski, said he "absolutely" plans to return once Enterprise is installed. NASA Administrator Charles Bolden announces where four space shuttle orbiters will be permanently displayed at the conclusion of the Space Shuttle Program during an event held at one of the Orbiter Processing Facilities, Tuesday, April 12, 2011, at Kennedy Space Center in Cape Canaveral, Fla. However, many of the other museums and their supporters took the announcement hard. "Like many Texans, I am disappointed with NASA's decision to slight the Johnson Space Center as a permanent home for one of the space shuttle orbiters," Cornyn said. Sen. Kay Bailey Hutchison and Reps. Kevin Brady and Ralph Hall, all Texas Republicans, also sharply criticized the decision in statements. Many Ohioans had hoped the National Museum of the U.S. Air Force, in Dayton, would receive an orbiter. "Obviously I am extremely disappointed in NASA's decision to overlook Ohio, the Midwest region, and the Air Force as a final home for a retired shuttle," Rep. Steve Austria, R-Ohio, said in a statement. Some lawmakers went so far as to request that the Government Accountability Office review the process by which NASA chose the final homes of the orbiters, to make sure it complied with the law. "We ask that GAO review how the disposition of the shuttle program-related property carried out, and if NASA and the Smithsonian did so in accordance with all statutory and regulatory guidelines," read a letter signed by Sen. Sherrod Brown, D-Ohio, and four members of Ohio's House delegation. The National Museum of the U.S. Air Force was a top contender for a retired orbiter. The Seattle Museum of Flight also hoped to receive one of the few space shuttles, even going so far as to start construction on a new exhibit hall for the orbiter before NASA’s decision was final. The museum will be able to fill the new Space Gallery with one of NASA’s shuttle mockup trainers instead. All of the museums that were denied shuttle orbiters are likely to get some sort of consolation prize, NASA has said. The Intrepid plans a lavish display for the orbiter on the western side of the pier, with a glass-enclosed building around it. "It should be this magnificent view, both from the highway, from space, from the air, and from the New Jersey side as well," Marenoff-Zausner said. The Intrepid already had a connection to the space program: The aircraft carrier was used to recover space capsules after flight in the early NASA Mercury and Gemini programs. On hand for yesterday's announcement were some who served on the Intrepid during its military tenure, including Mike Hallahan, 72, who served on the Intrepid while he was in the Navy from 1957 to 1960. "This is nothing but a booster," Hallahan said of the decision to send Enterprise to the Intrepid. "Hopefully it's going to inspire a lot of youths. If you take something where you can touch and see, as opposed to something you've seen on the television, it's going to make a big difference." Bolden chose to make the announcement of the shuttles' final destinations on the 30th anniversary of the first space shuttle flight, the launch of shuttle Columbia's STS-1 mission on April 12, 1981. The shuttles' retirement "is very sad," said Graeme Frears, 38, who was visiting the Intrepid museum from England. "They're 30 years old, but they still look futuristic to me."